» A Krispy Kreme Cheeseburger??? Let’s file this one under the “What will they think of next” category! I read today that an item known as ‘The Krispy Kreme Cheeseburger’ was introduced at the Wisconsin State Fair this year. It was a big hit. A chef right here in Georgia came up with the idea of a cheeseburger on a doughnut. Why am I not surprised? Critics are calling it “a heart attack waiting to happen.” What do I say? Well, I do like Krispy Kreme doughnuts (although I haven’t had one in a long time) and I like hamburgers (although not cheeseburgers). But picturing the two together made my stomach queasy. Does that mean that I would advise someone else who wanted one not to eat it? No. While you can eat anything, you shouldn’t eat everything! Many modern processed foods impair your body’s natural hunger/fullness signals, which can lead to out-of-control cravings and overeating. That statement applies to many junk foods and the manufacturers like it that way. The more you eat, the more money they make. My advice is to learn about the foods you eat regularly and the effect they have on your body. For example, if you eat a Krispy Kreme Cheeseburger regularly and find that it makes you bloated, drains your energy, or causes you to have a skin rash, then you may choose to avoid that food by personal decision. But when you’ve experienced the negative effects for yourself and decide that you don’t want them, then you are much more likely to stick with your decision. You own it. The fact is, having a Krispy Kreme Cheeseburger once a year (or any other unhealthy food rarely) probably won’t hurt you – unless you are allergic. It’s the foods that you eat over and over again every day that can. It’s a win/win situation: You can stay healthy and enjoy the taste of some of the unhealthy stuff…just once in a while. This is pretty unbelievable to think of eating such a thing. One thing the Lord has shown me too is the scripture in 1 Cor 10 where it says “All things are lawful, but not all things are profitable. All things are lawful, but not all things edify.”. I think this kind of thing is exactly what the Lord is referring to! YES you can have that Krispy Kreme burger if you want to. Just how is your body going to feel afterwards? Is it the wisest thing to do? Is it the most helpful and nourishing thing for your body? Definitely NOT! I am so glad I found this website..thank you…. 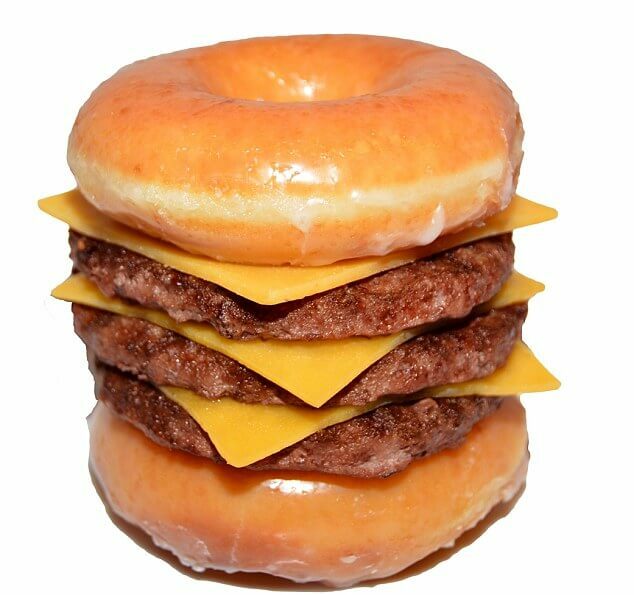 This type of foods (Krispy Kreme Burger) should be unthinkable to put on tv or elsewhere for people to find and use as a nutrient food is crazy….this is not encouraging for children to eat at all…and what’s funny (so to say, yet not!) this same chef is now suffering from diabetes. Can’t wonder!Yet….another chef is trying to use that same food by taking out some of it’s fat contents to make us believe it’s going to be healthier….so sad. Just take the so called recipe off tv and off line. It’s not a healthy choice by far. I pray for these two chefs. They know it’s not good putting that out there. I mean come on….just the donut alone….not good people and to add a fatty meat put in the middle of it with no telling what type of fat condiments….what are they trying to do….kill us? I’d be plum-shame to put those types of foods out there….I feel so bad for those that’s having a hard time as it is to control their meals, but to be encouraged this way. It needs to stop! Turn the channel…all I can say!